We can work with you to recommend, supply and install static flip flop screening systems. Static screens are easy to add to existing operations as well as forming a key component in a new system. Flip-flop screens expand upon the traditional linear vibratory screening method and the conventional circular vibration screens by combining the two motions in order to create dual vibration movement. These flip-flop screens are highly effective because with the aid of resonance they use only one drive to power the dual vibration, and because they come fitted with the latest BIVITEC screens, which are proven to be extremely effective in screening all manner of waste material. Widely used in the recycling industry, flip-flop screens are manufactured with polyurethane dynamic screening mats, which are contracted and expanded throughout the vibration screening process. Flip-flop screening equipment able to withstand high acceleration rates, are long lasting despite the constant flexing, easily changed when required and designed for a wide range of screen cuts from 0.2-50mm. We can provide new flip-flop screens featuring the latest technology, as well as proven used screens. 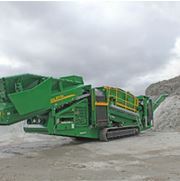 Flip-flop machines are available in a range of sizes and classes, and RG Recycling can recommend exactly which flip-flop screening machines will suit your requirements, based on the design and output capacity. Flip-flop screeners for sale from RG Recycling will all meet high efficiency standards, and are for sale or hire worldwide. We can even provide you with delivery and installation of new and used screeners. If your processing company needs to buy or rent a new flip-flop screener for recycling or waste processing, then RG Recycling can offer helpful advice and services. 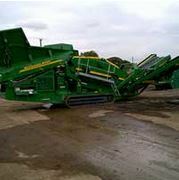 We can also provide you with used screeners that are proven in the field and offer excellent value. Simply contact us today for more information!